It's always fun going antiquing even if I don't plan on buying anything, but I do allow myself the possibility should I come across something enticing. That's exactly what happened to me on Monday. It had been a long time since I had even entertained the notion of visiting an antique shop, so I ventured forth and drove on a beautiful day over the Benjamin Franklin Bridge across the Delaware river (yes, the same river made famous by the Leutze painting of George Washington crossing it). Going back to my former hometown of Haddonfield is a nice treat since it doesn't happen all that often. I've shown you before what the main street looks like in that [town] with the numerous shops, cafes and restaurants; it is teeming with activity every afternoon. There's a little bit of everything for everyone here and I encourage you to visit if you're ever in the area. Some things have changed since I last visited, such as digital metered parking and stores changing ownership, but the main stores with vintage items and antiques are still standing. Luckily! As I was making my way down Kings Highway, I decided to stop at a store that I normally overlook. A mix of vintage-inspired home goods & furnishings are the forte of this particular place, but there are plenty of antiques scattered throughout the rooms if you look for them. As I made my way through the showrooms I checked off what I wanted to go back to. I was only able to take a few photographs, unbeknownst to the shopkeeper, because they don't really allow for photography at these types of establishments. Don't tell anyone! Luckily I found a few treasures. I parked directly across from the old library. The Haddonfield Public Library was a place I visited on a weekly basis when I lived here. It dates back to 1803 and was one of the first libraries in New Jersey. I've told you before that I adore trees and this one that's front and center is one of my favorites. It's an old copper beech that has been here for years. You should see the leaves when they're a dark plum color. Absolutely breathtaking! An street sign. Many of the streets are not only named after citizens from colonial times, but several are named after the professions of some. "Tanner" is where the tanner used to have his business. There's also a "Potter St." where stoneware used to get made. They still hand cobble shoes the old fashioned way at this store. The Estaugh Tavern has been around since 1740! These quirky copper fish encrusted with baubles flank a gorgeous gilded clock. Here I am inside the store I was telling you about. All of this furniture is colonial reproduction. You can see those old wood & tin chandeliers that were common among homes of the well-to-do. Finding originals can be time consuming and very costly, so it make sense to get an exact replica of an antique. They're just as beautiful. A kitchen hutch with candles, wooden trays and a few old crocks. I love the portrait painting. 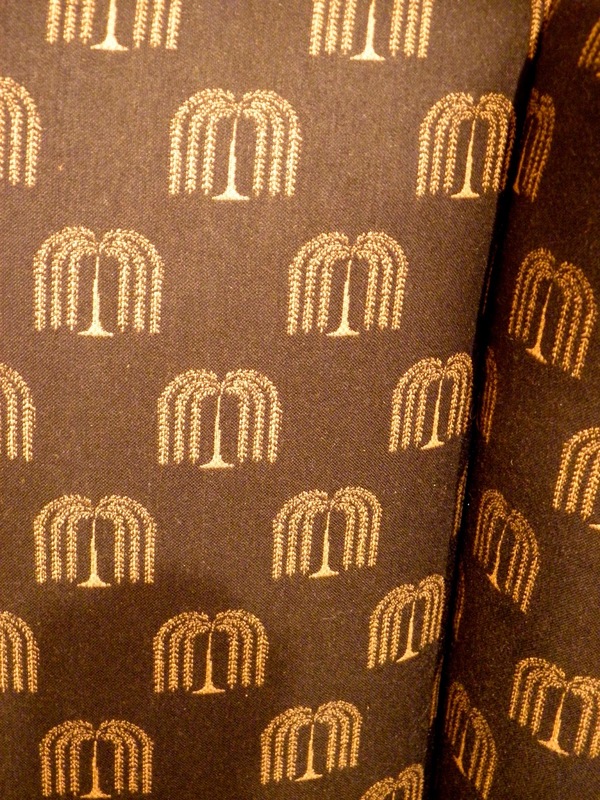 This wing chair caught my eye because of it's fabric. I just had to get a closer look at it. 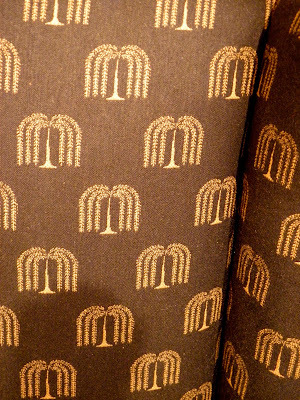 This pattern of a weeping willow has such a Shaker influence. It's stunning. A corner cabinet holds pieces of yellow ware pottery. If you know your antiques you can tell that some of these are reproduction and some are not. There's something about a colonial home with a few pieces of yellow ware that just seems right. Redware reproduction for those who collect it. 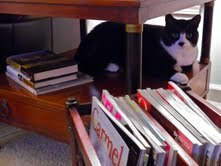 I took this photograph because I wanted to show you the quilt behind the hutch. Appliquéd leaves are attached to a light blue quilted background. I can see this in a bedroom with warm earth tones. I'm not sure if this granite ware bowl was meant to be used as a chamber pot or not, but I think it would make a nice composting bucket in the kitchen. Do you know what these are? After giving the store a full run and making mental notes of what was what, I went back and took a closer look at the vessels which were scattered throughout the store. I had the store's owner follow me from room to room picking these off from high shelves and setting them aside so that I could inspect each one. I did not hesitate to buy them because it's very unusual to find more than one of the same shape and color. Alright, I'll tell you what they are. They're pickling crocks from the 1800s. The ones here, in particular, were used for sauerkraut. I've actually seen an antique sauerkraut maker before, which is nothing more than a large mandoline-style bench where a cook would sit and shred the cabbage in large amounts. 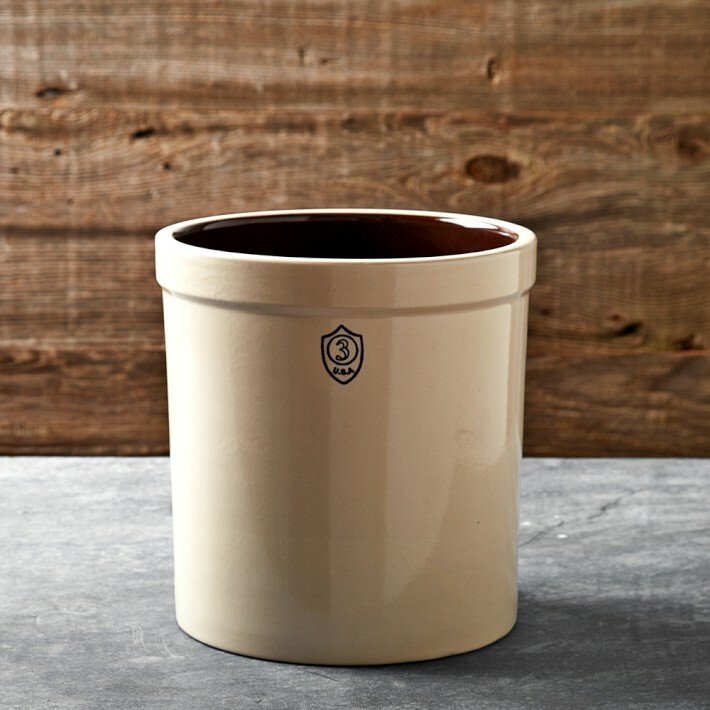 This is a contemporary pickling crock. Many people use these in their homes in various ways nowadays. I've seen them hold umbrellas in hallways, firewood next to a hearth, and rolling pins on kitchen counter tops. Martha has large ones at Lily Pond which she uses as recycling bins. Look at how varied and unique these are. Pops in the clay, drips in the glaze make them so beautiful. The insides of all pickling crocks were glazed to help the fermentation process. Three of the vessels had dark chocolate interiors and one had a light ochre tone to it. The undersides and the rims of the crocks are not glazed. They are rough clay and clearly worn with use. Perfect for one who collects antiques! This small counter under my "mise en place" cabinet was just the place for two of the crocks. I filled them with whisks, spatulas and spoons which are used exclusively for baking. I keep these separate from my every day cooking utensils. Don't they look right at home here? There were several things which I had to walk away from because I didn't want to break the bank, but I've made mental notes of them. Whether I go back or not to buy those items remains to be seen. Either way, I think my afternoon antiquing was a well spent one and I'm glad I made it back to my former town of Haddonfield. It's a place I will always consider special because I spent so many years there. I'm going to show you in the near future what I take with me whenever I go antiquing. You have to be prepared for the unexpected so I'll let you in on a few secrets. Stay tuned! I celebrated my birthday on Tuesday in a very low-key manner here at home, which is always nice because I don't like to make a huge fuss. Birthday cards, phone calls and notes from loved ones kept coming throughout the day (I love hearing from people near & far), but in the afternoon a very special box arrived via mail. I had been told prior to this that my dear niece was sending me one of her specialties and that I should look for it soon. Without a moment to lose I opened the box to see what was in it. I first read through the birthday card which had the outlines of my niece's & nephews' hands along with their names (these cards are saved & cherished!). A few written words are always greatly appreciated by uncle David. Next to that card, however, was a container of sweet edibles lovingly made by my little one, all packaged & cushioned with bright tissue paper. I gasped at how wonderful and unique her creations were as soon as I opened the cookie container. What made it even better was the fact that her cookies had been made in a little Easy Bake Oven given to her last Christmas! I was literally beaming through tears of joy at how far along my little one has come since her diagnosis with leukemia. It's amazing what two years can do with good medical care, lots of prayers and lots of love. Her journey & battle is almost coming to an end and the day she is given remission status, I will be the happiest person on Earth! Several things were going through my mind that day, other than the fact that I was extremely proud & happy at how my lovely niece had managed to bake cookies for uncle. Growing up, my wonderful grandmother used say, 'from generation to generation', whenever we'd learn something new either from her or from our parents. It was her way of saying that knowledge and wisdom was being handed down to the next generation of our family. Those words have always stuck in my mind, so when I realized that my niece was now showing an interest in baking cookies at age 4, grandma's words came racing back to me. With the help of my dear mom, I began to learn how to bake from a very early age. Her encouragement and lessons are things that are close to my heart. They always will be. Take a look at the gorgeous cookies created by my niece. Sugar cookies were baked in heart shapes, Xs & Os and were then covered with vanilla icing. To this, my niece cut out the exact same shapes in pink fondant with a stamped design and placed them over the icing. 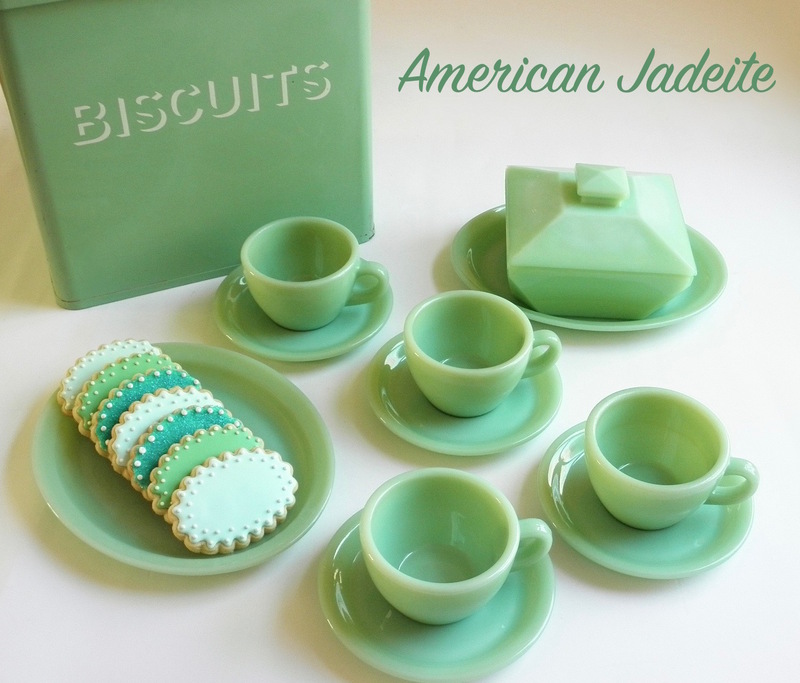 Beautiful cookies to behold and tasty cookies to eat. Champagne with strawberries & Appliqué Sugar Cookies. I now see that there is a future generation in my family who will understand the joys of baking. Knowing that my lessons and wisdom will be handed down to a dear family member brings me so much joy, because I love creating & teaching, and I love sharing. Realizing the fact that I'm inspiring my little one to bake just like uncle, well, life doesn't get any sweeter than this for me. As grandma used to say, "from generation to generation". Adorable dog cookie cutters in five charming shapes were available from Martha by Mail many years ago. 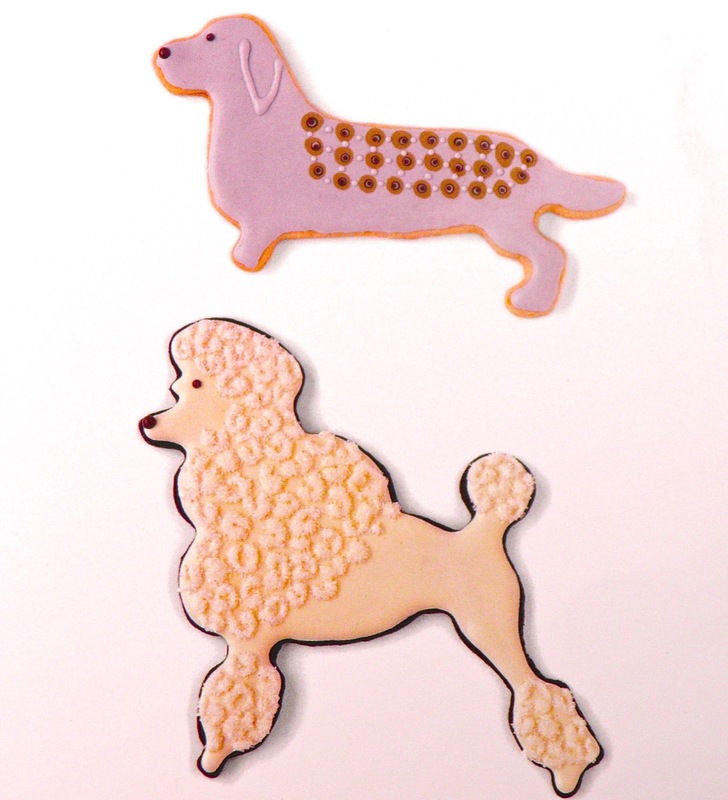 Any dog lover, baker & collector will adore having these cutters in their possession, because they make deliciously whimsical cookies any time of year. 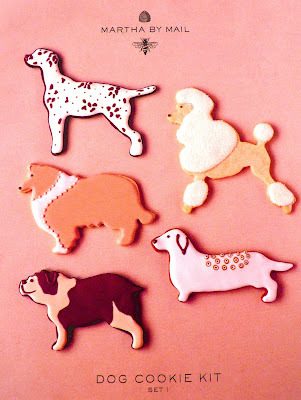 Pretty enough to make it to the Westminster Dog Show and win Best in Breed, these iced cookies will surely please the most discriminating dog owner. 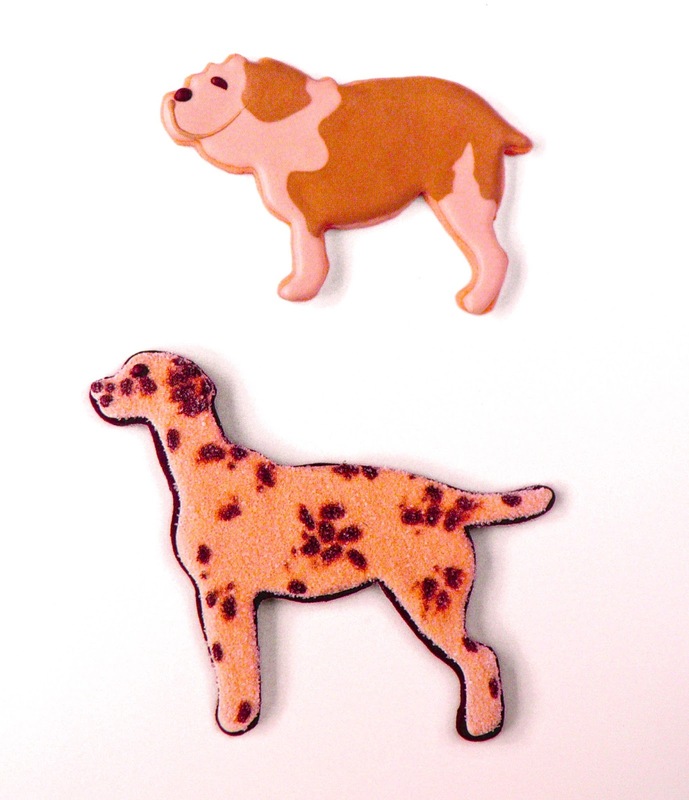 Set I had a spotted Dalmatian with a pointed tail ready to lead, a fluffy Poodle with prominent pom poms, a furry Collie with such a gorgeous coat, an adorable Dachshund with tiny legs and an elongated body, and of course, the lovable and cobby Bulldog with it's tiny tail. 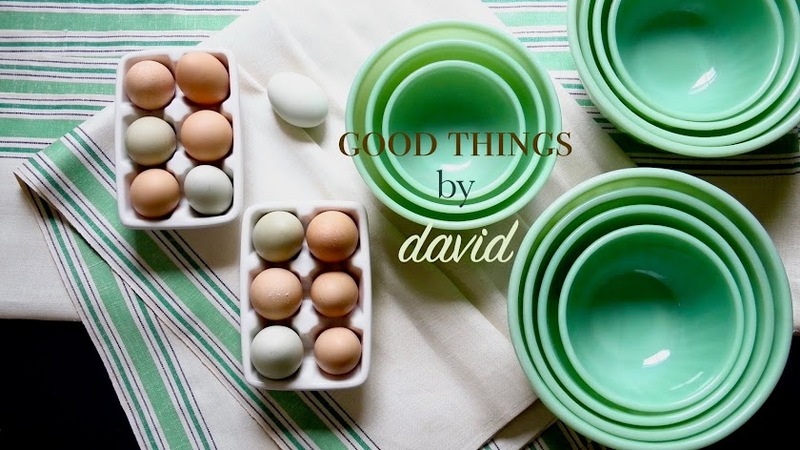 I've seen these make charming favors for birthday parties and as cake decorations, but they can be used for just about any type of celebration if put on platters or packaged up in clever boxes or cellophane bags. Why not surprise the staff at the veterinary's office the next time you take your dog in for a check up? Use a wonderful cookie recipe to bake the shapes and then find a tasty icing to work with. 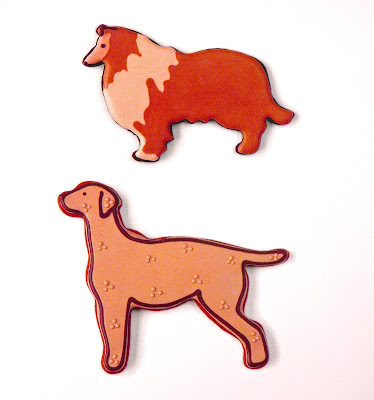 Mix your favorite colors and begin designing true-to-life doggies or decorate eccentric pooches. Visit my Monthly Cookie column for great recipes to help you make special cookies. Have fun baking and creating! The open back cutters in their original box. 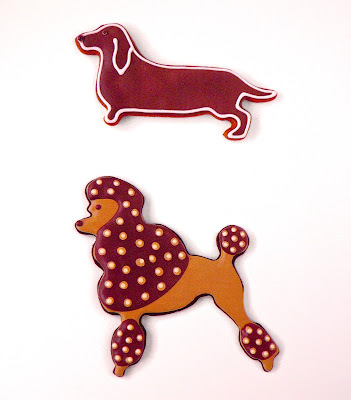 To decorate the dachshund, outline and flood the cookie with a smooth coating of thin royal icing, and allow it to dry. Brighten it up by outlining the body, ear and eye with thick white icing. Dots for a nose and eye make it ready for show. Polka dots make a perky poodle. Begin with a smooth layer of icing; let dry. Outline and fill the pom poms (the round tufts of "fur") with a contrasting color. While the icing is still wet, add large, evenly spaced dots in a lighter shade and tiny dark spots. Give a darling dog a dappled coat. Apply a layer of icing; while wet, pipe three rows of spots. Immediately dot darker icing on each spot, and add a nose and eye. When dry, pipe a floppy ear and tiny spots in between large spots. 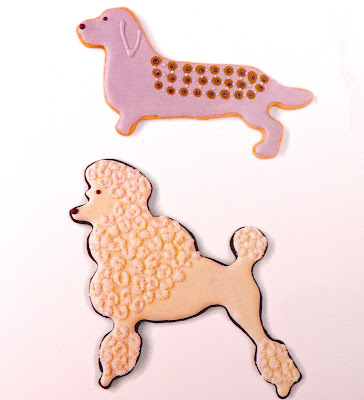 To make the prettiest poodle, begin with a smooth layer of icing; let dry. Use thick icing to pipe tiny curls on the pom poms; while wet, flock with sanding sugar. To make a brindled bulldog, pipe a curvy line from belly to back. Flood behind the line with icing, spreading it up over the hind leg. Use the same shade for a floppy ear. While the icing is still wet, cover the remaining surfaces with a lighter color of icing. When the icing is dry, use a small tip to add a jowl, a lazy half-moon eye and a nose. This dalmatian sparkles with sugar. First, flood the entire cookie with icing. While still wet, add clusters of dark spots, one cluster to form an ear. Flock with sanding sugar and allow to dry, then add a single dot for an eye. A collie with a cozy coat is easy to make. Outline a face and mane with contoured edges; flood with thin royal icing. While the icing is wet, flood the remaining surfaces with a darker shade, allowing the two shades to run together. When completely dry, use a dark shade of thick icing to outline a perky ear and make an eye. Tiny dots make a lovely labrador; an outline makes him stand out. Begin with a smooth, even layer of icing. Allow the icing to dry, then outline the body, ear, and eye with thick icing in a darker shade. Pipe evenly spaced clusters of tiny dots over the coat and ear. 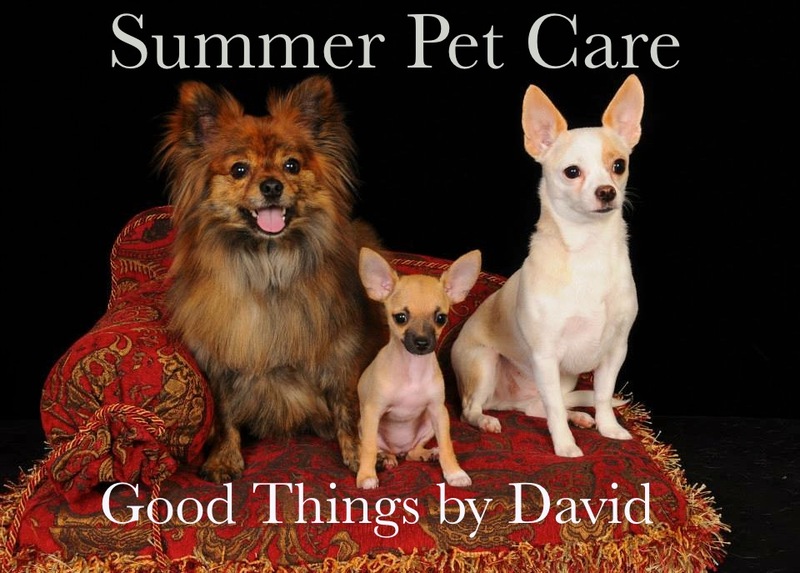 Summer is an especially difficult season for some of our pets and we must do as much as we can to ensure their safety and well being during this time. Everything from heatstroke to burned paws can be detrimental to a pet's health when the weather temperatures soar. As a pet owner, I take extra care of my four-legged little ones here at home because I don't want any mishaps or accidents to occur. Let's take a moment to review some safety tips and reminders so that our furry companions stay protected. If you're like me and think of your pets as members of the family, then you'll agree that adhering to a few basics is critical in keeping doggie or kitty comfortable and in optimal health. Just about everyone I know has a pet or two or three at home, so I thought I'd share with you a few wonderful images of their babies. They are pets of The Gregs. It may be tempting to leave dogs & cats outside unsupervised this time of year, but it is advisable to limit a pet's outdoor activities during summertime, especially when weather services announce heat warnings. Supervised outdoor time is fine as long as doggie or kitty has access to clean, fresh water and they aren't left outside for more than several minutes. Don't think that you can just let your dog and cat outside in the backyard all day. If you plan on taking your dog out and about, do be mindful of hot pavement, sidewalks and sand which can burn paws very quickly. If walking on a sidewalk, driveway, parking lot or on sand while barefoot is painful for you, then it will be the same for your pooch. You may want to get paw booties for your pets if you do take them out a lot. Also, never leave your pet inside a car, even if you roll the windows down a crack and are only going to be away for a few minutes. Conditions inside a sealed car on a hot day can turn deadly in a matter of minutes! Taking walks is part of a healthy lifestyle for our dogs, so during summer it's advisable to do so during the early mornings or during the evenings when the temperatures are lower and the sun is not overbearing. One needs to be mindful of heatstroke as well. Symptoms include vomiting, collapsing, lethargy, drooling, panting and fever. It's important to seek medical attention as quickly as possible if you suspect your pet is suffering from this. Organ failure and even death can occur if left untreated. Keeping your pets hydrated and cool is essential. Having access to water at all times is critical for cats and for dogs, but so is having a cool spot with some shade. If there are areas in your home which have tile, make sure your pets are allowed to rest there. You can also have a running fan somewhere in your house where your pets can sit and relax during the day. Tinks is staying nice and cool in the shade here. With most of us turning on our air conditioners whenever we're behind the wheel, keep in mind that coolant may leak as soon as we park our cars. Whether it's a garage, driveway or a part of the street where we keep our cars, make sure that your dog doesn't get into trouble by consuming coolant. It's very tempting for them because of its sweet quality, but it is deadly if ingested. Seek medical attention immediately if your pet has consumed coolant. Isn't Tobee adorable? 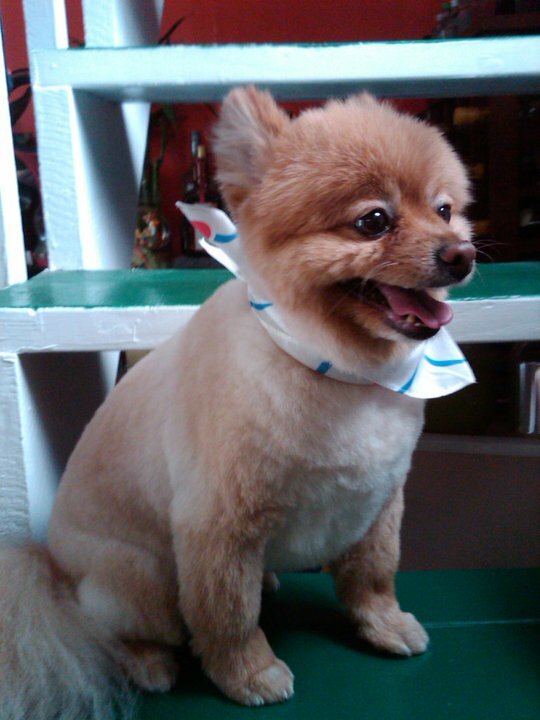 He's my friend's Pomeranian who gets shorn during the summer. 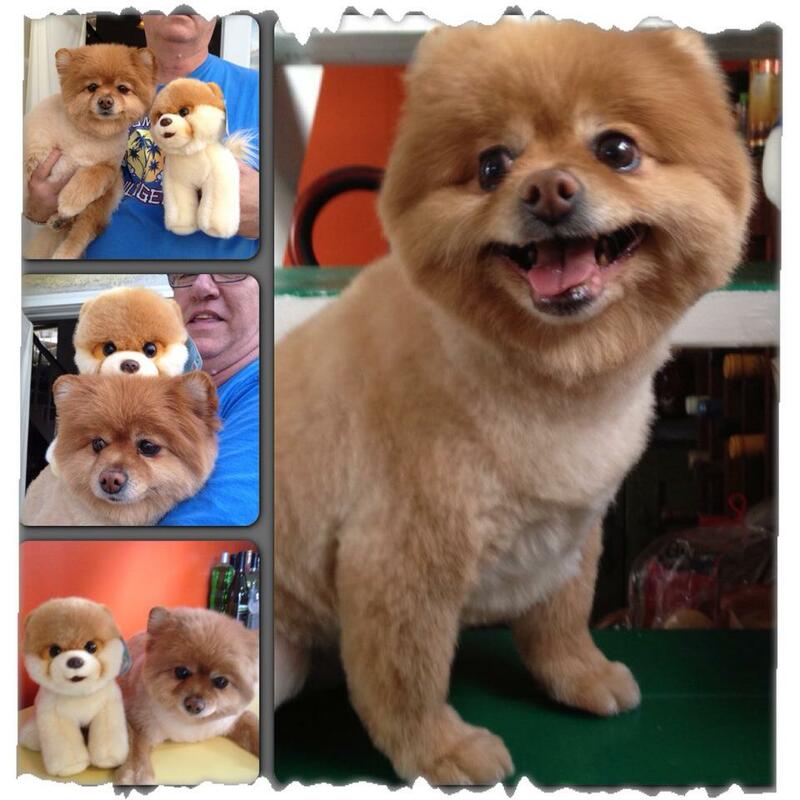 Patrick makes sure this little guy is a pampered pooch! Grooming our pets is essential this season. Cats and dogs require a bit different care when it comes to this,. For our dogs, we can have a groomer shear their fur down to about 1" from the skin and no further. This can keep them a lot cooler when the weather gets hot, but one should never trim their fur down to bare skin. Dogs need to have their delicate skin protected from the sun with some fur. Tobee (pictured above) is a good example of how a dog can be groomed during the summer. Cats should also be brushed regularly whether they are domestic shorthaired or longhaired. Untangle any mats and keep them from getting too furry during the season. It isn't necessary to trim their fur and in fact, cats do not like it. Brushing them regularly will keep them happy, just like my kitties are. This is Leo. A very adorable kitty who loves to be the center of attention. 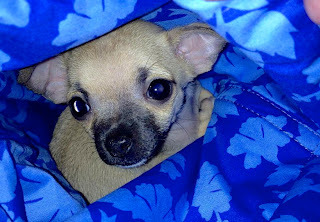 He's Janet's baby! As long as we're aware of what may potentially harm our pets and what will keep them safe and happy this summer, I think there's no reason why our dogs and cats should have a boring season. Here is to a safe summer for all of your family members! One needs to have an Heirloom Chocolate Cookie dough to complement the recipe for Heirloom Sugar Cookies from a previous post. This particular recipe has been used before to make lovely Mint Chocolate Cookies, so if you’ve already baked those magnificent treats, then you know what you’re in for. Let’s focus on the dough, because it’s such a great recipe to work with and is meant to be used with any type of cookie cutter. Using the finest dutched cocoa powder will yield a thoroughly rich cookie with a dark coloring. People respond to these cookies because of it. I’m partial to iced chocolate cookies for birthday parties and celebrations. My niece and nephews adore the chocolate cookies I bake during the holidays, so I know for a fact that they’re well received by little ones. Adults will love them to! I don’t add a lot of sugar to the recipe because the cookies don’t need it. 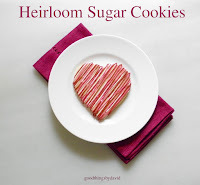 Just like the Heirloom Sugar Cookies, these tender morsels don’t contain any leavening agent. 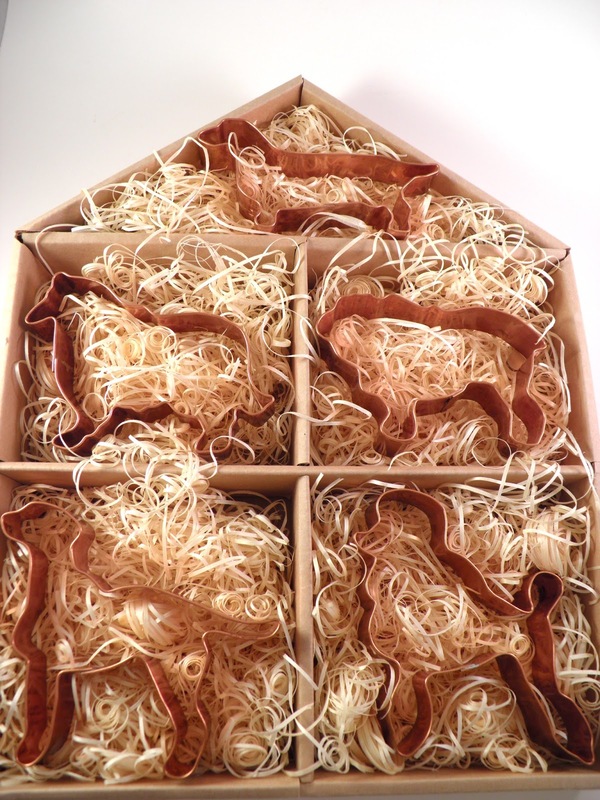 Every single cut out, whether it’s a simple square or an elaborate and fancy Bunny & Chicken will hold its shape during baking. Piping a bead of royal icing along the outline of the cookies for flooding will be a snap for all of you. Here’s the recipe once again, minus the sandwich filling. Remember this dough and use it for your future baking projects. In a bowl, sift the all-purpose flour, dutch-process cocoa powder and fine sea salt. Set aside. In the bowl of a stand mixer fitted with a paddle attachment, cream the butter on medium speed for 1 minute. Add the granulated sugar and continue to beat for 3-4 minutes or until light and creamy. Stop and scrape down the bowl & paddle at least once during this process. Add the egg and beat until combined and emulsified, about 30 seconds to 1 minute. Add the vanilla extract. Reduce the mixer speed to low and add the reserved dry ingredients. Beat until a mass of dough forms. Remove the dough from the bowl and divide into 2 disks between overlapping pieces of plastic wrap. Chill the dough for at least 1 hour. The dough can be refrigerated for up to 2 days, but it can be frozen for up to 1 month in a zip top bag (thaw overnight in the refrigerator). On a lightly floured surface, working with one disk at a time, roll out the chocolate dough to 1/8” in thickness. Cut out your cookie shapes, dipping the cookie cutter in flour as you work to reduce sticking. Any excess flour left on the cookies can be brushed off with a clean pastry brush. Arrange the cookies about 2” apart on cookie sheets. Chill the cut outs for 30 minutes. Bake each sheet of 5-6” cookies for approximately 12-15 minutes. The tops will feel set. Let the cookies cool on the baking sheets for 5 minutes. Transfer them with a wide spatula onto racks and cool completely. If you want to make cookies extra special, take 1 disk of this dough and mix it with the Heirloom Sugar Cookies to create marble cookies. Mix pieces of chocolate & sugar cookie dough as you would play-doh. The dough should be handled and baked just as you would either of the recipes. The photos above are courtesy of my friend Janet. She made my recipes a few days ago and had great success with them. I'm not surprised, because Janet is a superb baker!! What’s lovely about making marbled cookies is that each cookie will be entirely different. No two will be alike. Surprise your recipients and let them figure it out on their own. Marbled Cookies by Janet! Go to her post and read how she made these unique cookies. Click [here]. Here are a few of my marbled cookies. You can see how varied and unique the cookies can be when you work the dough this way. The wings on these cookies are so nice. Stacked on this baking sheet are the Heirloom Chocolate Cookies and some Marbled Cookies. Delicious!